S&S Cycle attended the 2014 JP Stroker S&S Cup finale at the Fukushima Sky Park, near Fukushima, Japan Oct 25th and 26th. S&S was represented by Manufacturing Services Manager, Bill Wise. Bill attended the final race and handed out prizes and trophies during the awards ceremony at the Sky Park after the race. This is the fourth year for the JP Stroker S&S Cup Series and the program is gaining more momentum every year. There are five racing events at various locations throughout Japan, with the final race at Fukushima. The series is sponsored by S&S Cycle and JP Stroker, the only S&S distributor in Japan, and is held under the auspices of the V-twin Drag Association of Japan. Although there are many participants backed by Japanese speed shops, and private race teams, some of the fiercest competitors are employees of JP Stroker. These guys are really “into it” and are not afraid to invest the time and effort to build highly competitive race bikes. That’s why they are in the business! 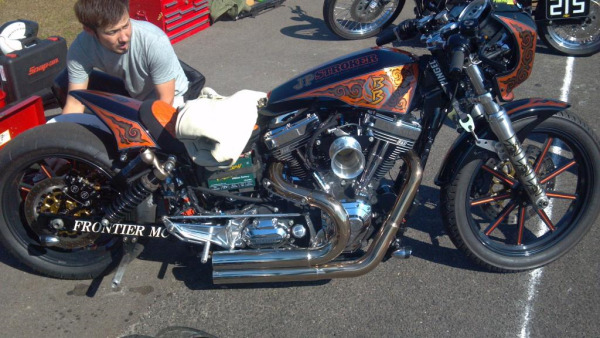 There are a number of classes for modern and vintage bikes of different degrees of modification, so there is an opportunity for just about anybody to race, and to race against comparably equipped opponents. It also allows racers with different styles of bikes and budgets to compete. The speeds for this event were somewhat lower than at some of the other S&S Cup events. The altitude was definitely a factor. The Sky Park is on top of a mountain, and thinner air makes less power. But another factor may be that at the end of the tarmac is a shear drop down the mountain side. That’s got to be on your mind as you speed headlong toward the end of the track!